The weight of expectation that has been placed on Christian Eriksen's broad shoulders from a young age is such that carrying the hopes of a nation into the World Cup play-off against Ireland is nothing new. A lot has been made of the dangers of not looking beyond Denmark's gifted playmaker but the fact is few can turn Ireland's dream into an nightmare as quickly as Eriksen (below). The 25-year-old is a rare breed in a modern age where crazy salaries and over-the-top transfer fees are paid for players but Eriksen has opted to take a more measured approach en route to the top. Long before Eriksen had become Denmark's youngest debutant since Michael Laudrup in March 2010, the comparisons with the finest player that his country has ever produced had been rife. Eriksen isn't blessed with blistering pace or brute strength but like all good playmakers, he plays the game one step ahead of everyone else around him. Vision "He has great vision and a talent for scoring goals," Laudrup said of the heir to his throne. "He might not be the fastest football player, but he thinks faster than others, and that makes him different." Down through the years, there has been more than one cautionary tale about moving from the Eredivisie to the Premier League but Eriksen has never fallen into that bracket. At Spurs, Harry Kane's prolific goalscoring form has seen him grab all the headlines but he owes a lot to Eriksen. Last season, he provided 20 league assists (four more than his impressive haul the previous year) to go with his eight goals. His grounded approach comes from his upbringing in Middlefart, a small town in Central Denmark. Up until he was 13 when he moved to Odense BK, his father Thomas coached him. It wasn't long before the big European clubs came calling and trusting his father's advice, Eriksen snubbed plenty of more lucrative offers to join Ajax, who are of course renowned for nurturing special talents. Before Eriksen signed for Ajax as a 15-year-old, he had two trials with Chelsea. When the club asked him to come to London for a third, Thomas stepped in and suggested that his son looked elsewhere - insisting that the club had had enough time to consider him. Chelsea were among a long list of potential suitors; Manchester United, Barcelona, AC Milan and Real Madrid all chased his signature but none felt like the right fit. "It was another world, the football was a little bit more powerful than what I wanted," Eriksen recalled of his trial with Chelsea. Eriksen went on to win the league title in every one of his four years with Ajax and as he continued to swat aside the interest that was rapidly growing, the club were resigned to eventually losing him. "He's a player I really like with all my heart," the late, great Johan Cruyff said, summing up the feelings of every Ajax supporter before he left for Spurs for a paltry £11m in 2013. He committed his long-term future to the club last year but given that Daniel Levy is prone to selling Spurs' stars for hefty profits, it seems almost certain that unless the club win silverware this season or next, one of Europe's powerhouses will pay the kind of fee that Eriksen has been long been destined to leave for. By the time he had eventually made the move to London, Eriksen was a household name back home and was the youngest player to feature at the 2010 World Cup where Denmark crashed out at the group stages. Despite finishing second in their qualifying group for the last World Cup, Denmark were ranked as the worst of the nine runners-up and so did not advance to the play-offs. This time around, second place was enough to earn a shot at making it to Russia next summer and for Eriksen, there is a sense of unfinished business on the world stage. At 25, he has already played a staggering 73 times for his country and considering that eight of his 18 international goals came during the qualifying campaign, he has finally silenced the many critics who believed that he rarely translated his club form into similar levels of performance for his country. Eriksen has had to overcome some harsh criticism back home, including from his then manager Morten Olsen who pinned all the blame on him for his side's defeat to Portugal three years ago which scuppered their chances of making it to the Euros but he has come out the other side. At Spurs, he is known as 'Golazo', a Spanish word meaning, 'screamer', which is a clear nod to his penchant for scoring stunning goals. Given the quality of goals that he has scored for Denmark in the last year, he is now laying claim to the nickname in the international set-up as well. One more goal this year would make it Eriksen's best yet in red and Martin O'Neill is mindful of the threat that he poses. masterminded "Eriksen has masterminded nearly all the proceedings," the Ireland boss warned. "He has put himself into a big European category, there's no question. He is one of the main players playing for Tottenham Hotspur at this minute if not the main one. He makes things happen. "You can try to make some plans for players but great players elude them, they get a moment or two in the game and we have to be really careful with it. "He's a top-class player, he can avoid tackles, he's playing exceptionally well in a team that have just beaten Real Madrid in the Champions League. "He's a top-quality player and we have to give him the respect he deserves." Ireland have no reason to fear Denmark but in Eriksen, they have the only genuine world-class operator who will be on show over the two legs. 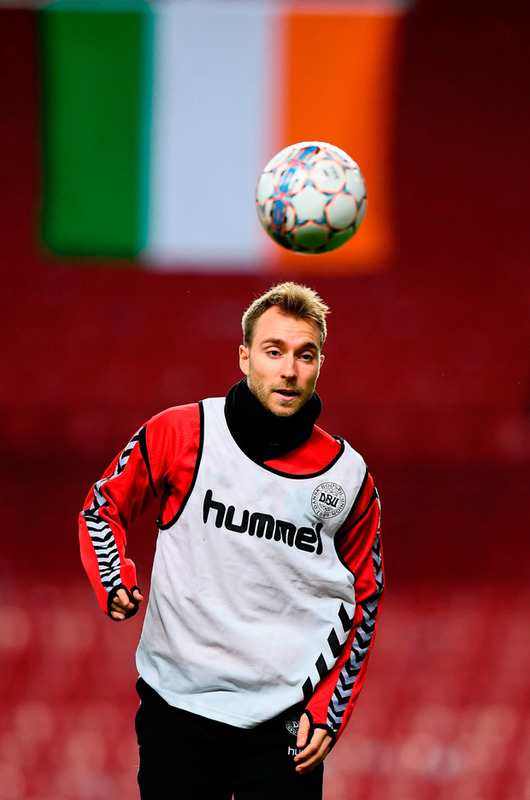 At club level, he has thrived out of the spotlight and although that is now beginning to change, Eriksen remains front and centre stage for Denmark.